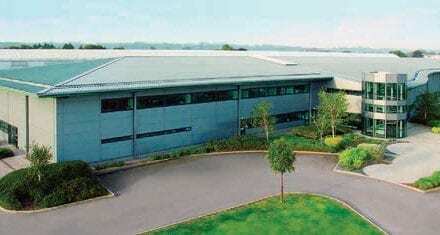 MARINE, LEISURE AND ADVANCED ENGINEERING COMBINE TO MAKE PLYMOUTH A LEADING MANUFACTURING AREA. Steve Gerry (PMG Secretary), Chairman Catherine Harris and local MP Luke Pollard at the lobby event in Westminster. 2018 was the 40th Anniversary of PMG (Plymouth Manufacturers’ Group). While celebrations included a gala dinner, the main focus throughout the year was on the achievements of our manufacturing business members and on measures to attract more people into our industry. It may come as a surprise to many that Plymouth actually has the highest concentration of manufacturing jobs of any city in the South. At 11.8%, it is higher even than Portsmouth and Luton’s 9.5%, according to Centre for Cities – Cities Outlook 2018. The latest estimated figures released in December 2018 by the Office for National Statistics (ONS) revealed that Gross Value Added (GVA) from manufacturing in Plymouth rose 4.3% between 2016 and 2017, and now stands at a record £866M. This represents 16% of the total Plymouth economy, valued at £5.4Bn. 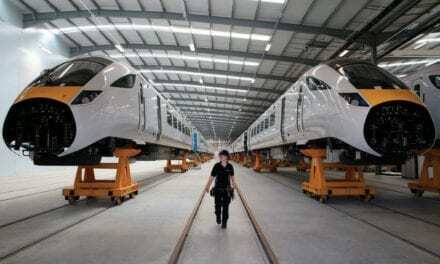 Growth in the manufacturing sector locally since 2010 has been nearly forty per cent. The range of manufacturing businesses in the city is wide. While the luxury marine vessels of Princess Yachts may be the most visible products of Plymouth industry, its strengths include IT companies, automation specialists Rittal-CSM (Western Morning News’ Manufacturer of the Year), global organisations like Schneider Electric, household names such as The Wrigley Company, Kawasaki, Ginsters and Babcock Marine, and a range of SME and ‘Mittelstand’ businesses in their own niches or part of a larger supply chain such as injection moulding specialist Algram, which also supplied PMG with its current Chairman, Catherine Harris. As with the rest of the country, Plymouth is affected by skills shortages. That situation will only get worse if nothing is done about it, so PMG is doing something about it. 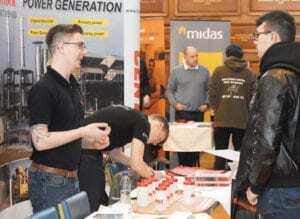 In March, it organised its fourth Apprentice Jobs Fair, held this year in Plymouth Guildhall, which attracted a record numbers of visitors and was deemed a great success by exhibitors and visitors alike. 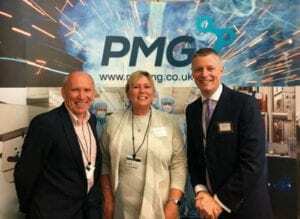 This was the second occasion that the PMG had shared the event with construction firms, who were represented by the sectoral group ‘Building Plymouth’. Between us, these two major sectors account for nearly a quarter of Plymouth’s economy and 1 in 6 of all jobs. This year we had forty-five different exhibitors and we attracted almost a thousand people through the doors. 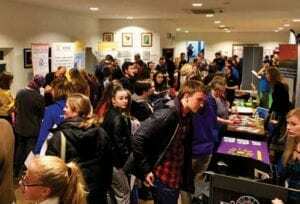 More than 30 exhibitors took stands at the Women in STEM Plymouth careers event in November. Later in the year, in November, PMG sponsored the Women in STEM Plymouth careers event, which was hosted for the second year in succession at Dartmoor Zoo. 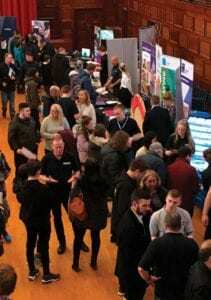 More than 30 exhibitors had stands and the overall response from visitors was very good indeed. More than 70% of those attending said that it had raised their awareness of STEM careers generally. While this is very satisfying it does show that there is still work to be done in making young women, especially, aware of the wide range and valuable opportunities available in manufacturing, science, technology and engineering. In the Spring and Summer, PMG sponsored and supported two awards. For the first time, it sponsored the Quality Award at the West Devon Area final for the Young Enterprise Company Programme, which fosters and encourages school students to set up and run their own businesses. The young entrepreneurs had to produce a business plan, give a pitch, attend an interview and sell their products at Christmas and spring trade fairs. They can employ up to 25 people – usually their fellow school attendees. The ‘podium’ at the regional final was made up of Devonport High School for Boys’ Link company, which developed a diary for dementia sufferers; Eclipse, from Devonport High School for Girls, which presented a tooth cleaning kit for children; and the Endeavour team from Tor Bridge High, which developed a travel mug that comes with a temperature gauge, telling users when a hot drink is cool enough and won’t scald them. The finished product was so good that it was Tor Bridge’s Endeavour team that was presented with PMG’s Quality Award. The Year in Industry competition, run in conjunction with EDT (Engineering Development Trust) South West, returned after a one-year gap. 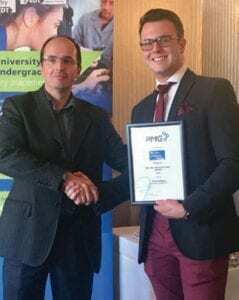 This year’s winner was Sam Spears, who demonstrated an all-round understanding of the impact that his project had had on his employer, Schneider Electric, including a clear knowledge of costs and benefits. Sam was presented with his certificate – and cheque for £300 – by, appropriately enough, Schneider Electric’s PMG representative, Paulo Raquel. As part of its 40th Anniversary celebrations, PMG organised a group trip to London, with the help of local MP Sir Gary Streeter. The intention was to raise Plymouth’s manufacturing profile in the Capital and to spread the word about the significance of our sector to the local, regional and national economy. Richard Harrington MP, Parliamentary Under Secretary of State for Business and Industry, addressed the group. Representatives from innovate2succeed made a presentation on the range of support available from government-funded programmes to help businesses. As well as the programme of awards and profile-raising, PMG regularly organises educational and informative events for members. These included a presentation in February from the Government’s innovate2succeed project, outlining the range of support available from government-funded programmes to help businesses to innovate, partner, export and access grant funding, particularly aimed at smaller network members. At the end of the year, the 2018 Christmas Lecture was presented by Dr Gertjan Vlieghe, External Member of the Monetary Policy Committee of the Bank of England. Dr Vlieghe’s talk, entitled ‘The Economic Outlook’, analysed the current economic situation, considered a possible change in the long-term relationship between unemployment and wages, and discussed the impact that the Brexit vote was having on UK business investment performance. Looking forward, Brexit is the great imponderable. At the time of writing, we don’t know what is going to happen and whether the country will actually leave the EU at the end of March. What we do know is that Plymouth’s businesses have taken everything that has been thrown at them over the past 40 years and come back, stronger than ever. We hope for the best but are prepared for whatever is to come.